However, there is no reason to say that the quotation was fabricated. VG's chief editor Gard Steiro and Tora Bakke Håndlykken, news editor of VG. Photo: Petter Marselius Henriksen. 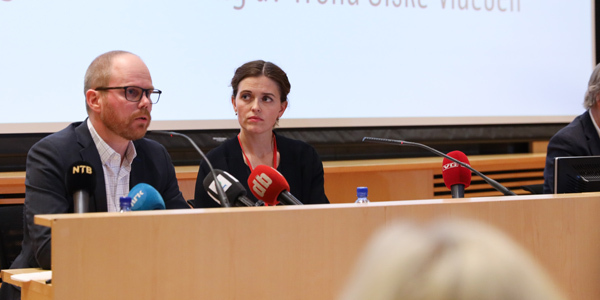 VG presented the report last night, which deals with a comprehensive evaluation of the work that was done in connection with the news coverage of the Trond Giske video from Bar Vulkan in February. Here are the main conclusions from the report. “Our internal evaluation started in late February. After TV2’s publication of the case, the chairman of VG, Torry Pedersen, ordered a report,” says news editor of VG, Tora Bakke Håndlykken, who has led the evaluation work. It is always the responsibility of the press to safeguard sources in a good way. Sofie is not a professional source and in such cases, the report states that extra care is required. The assessment is that VG has failed in its handling of Sofie as a source and interview object. She has been put under high pressure and quoted in statements that she cannot support. This is reprehensible. The requirements for contact and quality assurance are higher when handling sources that are not professional. However, VG does not find grounds for concluding that VG’s reporter in the case, Lars Joakim Skjervøy, has deliberately fabricated a statement from Sofie’s side. Communication between the journalist and Sofie is almost characterized by the fact that she gives up communicating the version she wants to stand for, which is serious enough in itself and supports that she has felt the pressure. In her communication with VG by SMS and on the phone with Gard Steiro, Sofie expresses strong dissatisfaction with the coverage, especially with the use of the quotation in the case. The report states that on Steiro’s part, this meant that he, on the one hand, referred to an interview object that clearly and consistently stated that VG’s coverage was misleading and erroneous, and on the other hand, to confirmation from an own journalist that the quotation had been cited and preapproved. He is in a situation of pressure, between loyalty to his own reporters, and a source who believes that VG has misrepresented and subjected her to pressure. Even though information was immediately submitted from NRK’s article to VG’s article, this pressure has, in our opinion, contributed to weak and delayed handling of the situation. The main concern should have been to bring accurate information about the woman’s experience to VG’s readers. VG should have excused the case straight after Steiro’s conversations with Sofie. The report also concludes that in this case, there has been poor management and quality control. In a media house such as VG, it is important to have a chief editor who is close to the journalists and journalism, but in this case, Steiro entered an operational role that also created challenges for him in the handling of the case after publication. An important source, in this case, is the woman who created the video. She was not conferred prior to publishing. The lack of greater selection and follow-up of sources is a management responsibility where, in this case, the reporting management has failed. This is something that VG must learn from. The media is often criticised for lack of correction and apology. Therefore, a key question is when and how VG apologized the mistakes made in this case. VG’s apology came too late, it did not cover all the weaknesses in the original article, not least the quote attributed to Sofie and her treatment as an interview item. The report states that VG should have apologized more clearly to Sofie and Trond Giske. “A distinctive part of the editorial role is to continually expose fresh news, in the case of VG, to millions of readers every day. Once in a while mistakes will be made and they must be corrected and apologized. There is nothing in Steiro’s exercise of the editorial role in VG that shows that he is not very clearly aware of this responsibility,” says Torry Pedersen, chairman of the board of VG. “In the enforcement of responsibility, it is important for a board to consider consequences proportionally with errors that have been committed. It is not a proportional consequence that Steiro should leave as a consequence of this matter. The board of directors has full confidence in him to continue leading VG, and to implement the proposed measures,” says Pedersen. – VG’s work on this case is not over with this report. We will use criticism and errors as important learnings in editorial work going forward. The case has also reminded us that it can be very demanding to be in the media’s spotlight. Now we have experienced what it is like to be on the other side. We will take that lesson with us,” says Tora Bakke Håndlykken. This case has had and will have consequences for VG editors, both systematically and on an individual level.